Community Financial Services Group is your complete investment solution. We listen. We make sure we understand your complete financial picture before providing you with sound advice to address your needs and goals. We can assist you with Investment advice and management, Trusts (Revocable Living Trusts, Irrevocable Trusts, Charitable Trusts), Retirement plans and IRAs, and minimizing Estate and Income taxes. We help clients plan for and make that exciting, yet also challenging, leap into retirement. For many people, it’s the biggest financial milestone of their lives. We want to help them make the most of it and enjoy this time. Sometimes our clients encounter forks in the road due to company mergers, buyouts and consolidation. At these critical points, we are there to advise you and update your approach to retirement as your situation evolves. You won’t be alone. We manage a number of trusts for beneficiaries and also act as a trustee. Often trust beneficiaries receive minimal service from large, out-of-state institutions. Our goal is to change their entire experience with our local trustee service. We can also help set up charitable trusts or other types of trusts to help reduce potential estate taxes, avoid probate or achieve your estate planning goals. Perhaps your concern is helping family members who may have current or future needs. We’ll take the time to get to know those people you care most about and offer strategies on ways you can help. CFSG offers many retirement plan options, including 401(k), 403(b) and Simple IRA plans. We are able to offer retirement plan solutions for small businesses or for large companies. We will take the time to educate employees about their retirement plan choices and regularly meet with plan participants to help provide them with contribution and investment guidance. Often our clients want to maximize their tax savings through their retirement plans and we help them evaluate the various types of plans to determine what is best suited to their situation. 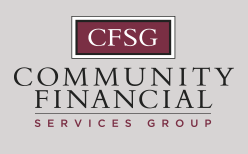 Community Financial Services Group, LLC (CFSG) is the trust and investment management affiliate of Community National Bank, National Bank of Middlebury and Woodsville Guaranty Savings Bank. CFSG is also the trust and investment non-affiliate for Peoples Trust Company of St. Albans. CFSG accounts are not obligations of, or guaranteed or insured by any bank or any depository institution, the FDIC, the Federal Reserve Board or any government agency. Investments are subject to risk, including the possible gain or loss of principal.